ETN satellite service provider in Pakistan - new cameras. 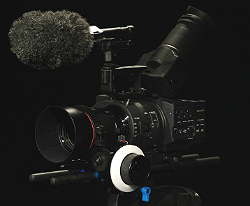 Islamabad, March 2014: ETN has announced that it has invested in tapeless cameras to service the fast-paced news environment. The company says it has opted for Sony's EX3 and fs700 cameras which will improve the workflow and include faster ingest of footage to edit bays. ETN is now also promoting use of IP broadcasts through a variety of new technological developments that use IP links for low cost and high quality transmissions. With bureaus in Islamabad, Lahore and Karachi and seasoned multi-lingual reporters, ETN says it is the largest satellite broadcast service provider in Pakistan and has associations with leading global broadcast facilitators.